The Airports Company and others ran annual Air Access/Seasonality conferences for 10 years. They achieved very little. When Tim Harris took over at CEO at Wesgro, Air Access was one of the first things he tackled. A tender was published, a team appointed and serious work began. A year ago, I bumped into one of those who had been involved in the old inititiaves and he asked if I had heard about the new Air Access initiative, and jokingly wondered if it would just more of the same. A year later his comment was, "The success is phenomenal!" Paul Van den Brink was part of that initial team appointed by Wesgro and has stayed on to head up the Air Access unit at Wesgro. In 1½ years they have been phenomenally successful. 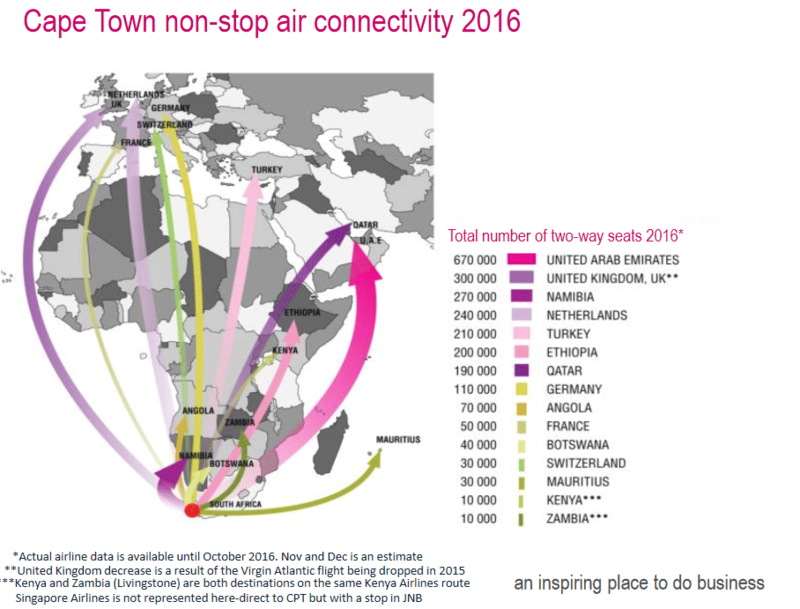 They have added over 400,000 extra two-way seats on international flights into Cape Town, either through additional flights by current airlines or by attracting new airlines. Has there been a more significant tourism achievement in the past decade? I don't think so. All other tourism spend and initiatives pale in comparison. Surely it raises the question of redirecting more of existing tourism agencies' budgets to the Air Access initiative? New route establishment (facilitating the establishment and initial feasibility of new routes). This means more non-stop flights to strategic markets; increased non-stop connectivity to global and regional hubs; ensuring the frequent flight schedules (min 3–4 times a week); anchoring year-round services to establish supply stability to key markets; and providing a more competitive landscape that reduces ticket prices. CTAA has formalised governance structures set out in a Memorandum of Understanding between the five public partners: Wesgro, Western Cape Provincial Government, City of Cape Town, Airports Company South Africa and Cape Town Tourism. CTAA has developed a Private Industry Advisory Board with governance structures for businesses with a vested interest in air route development through CTIA. (Wesgro has already attracted two large coporate funders for this initiative - Naspers and Investec.) The only other existing Air Access team in South Africa is in Kwazulu-Natal, which is, apparently, very well funded. 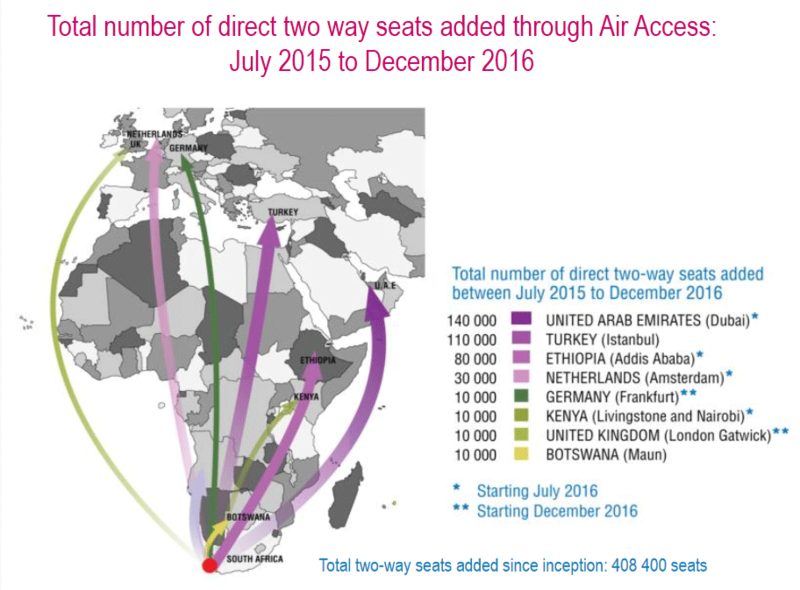 ACSA is starting to focus on Air Access nationally and it will be interesting to see how that directs its focus. Successes have been achieved largely through the efforts of Paul van den Brink, CTAA's projects manager. He says their new focus will be on developing the North American market, pointing out that flying to Miami via Sao Paulo will save five hours in flying time when compared to existing routes. And there Cape Town businesses who are keen to help support an initiative for that route. Paul studied economics and marketing at the University of Eindhoven in the Netherlands where he graduated in 1995. In 1996 he moved for the first time to South Africa, where he worked for the South African Netherlands Chamber of Commerce (SANEC) in Johannesburg to promote the bi-lateral trade relations. He joined as project manager and was promoted to general manager in 1998. In 2001, Paul returned to the Netherlands and started his career in the airport industry. He worked for the Schiphol Area Development Company (SADC) as International Marketing Director until 2013. He was responsible for the international marketing cluster strategy of one of Europe’s leading airport regions eg. Attracting large multinational companies to the airport as well as improving Amsterdam’s air network for both passengers as well as cargo. This strategy and approach was awarded best practise case by McKinsey & Company for the Dutch Innovation Platform. At the end of 2013, Paul moved with his family to Cape Town and started working as an independent consultant. He is currently working on projects for the Dutch Ministry of Economic Affairs for two days a week and spends the other three days as project manager of Cape Town Air Access at Wesgro, since July 2015.